Could the winner of the competition also win the May 17 primary? 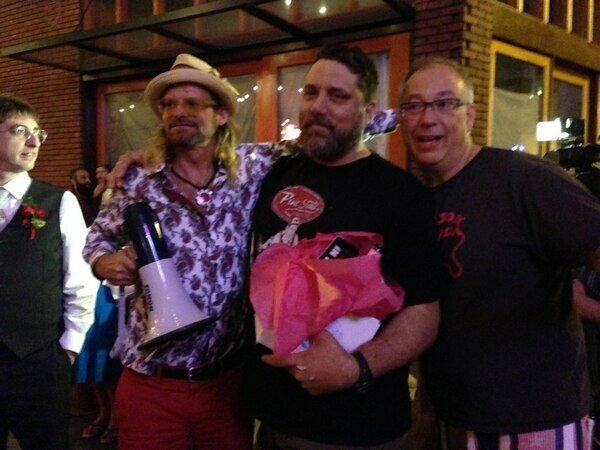 "It's become as important as Iowa," declared Tres Shannon, co-owner of Voodoo Doughnut. 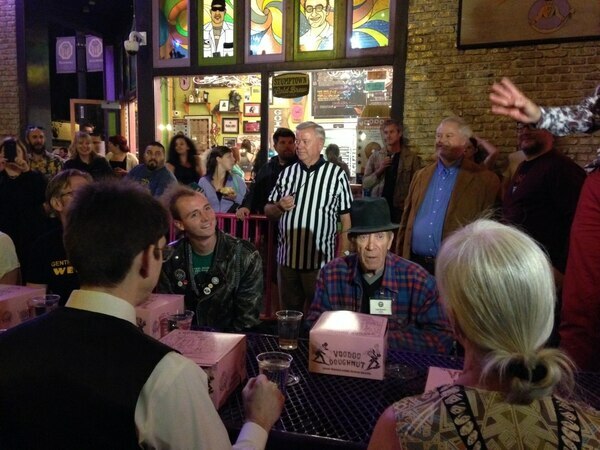 As candidates for Portland mayor prepared to tear into pink boxes of donuts, the evening's referee, former Mayor Tom Potter, readied his whistle. 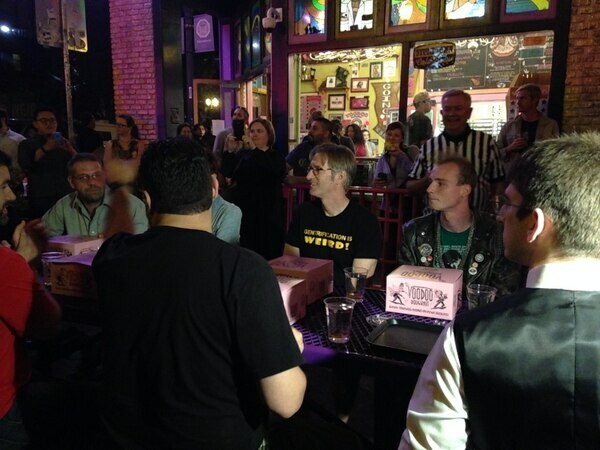 If anyone in the crowd of 50 to 100 people had any sympathy for what the candidates were about to go through — eat three donuts as quickly as humanly possible to claim the title of fastest donut eater among candidates for Portland mayor—it was Potter. Twelve years ago, before his victory over then-City Commissioner Jim Francesconi, Potter was one of 23 mayoral candidates in the May primary (including two* who are running again this year). Former Mayor Tom Potter refereed the contest. Seated and in a hat is Lew Humble, a perennial candidate who ran and lost against Potter in 2004. When Francesconi decided apparently to skip the contest, Voodoo Doughnut decided to honor his presence anyway by asking contestants to eat 11 donuts—one for every letter of his late name. Inked in frosting on the donuts were the letters F-R-A-N-C-E-S-C-O-N-I, says Potter. Potter says the winner was a rather large candidate he'd never seen before and that he thought might possibly have been a ringer. "Tres insists he was a real candidate," says Potter's wife, Karin Hansen. On Friday night, as tourists and bar hoppers in downtown Portland looked on, candidates munched on three donuts, including Portland's official donut, the Portland Creme, and one called the Pothole—a tribute to the city's crumbling roads, not its burgeoning marijuana business. Sean Davis, an Army vet and community college instructor who's polling around 1 percent, edged out everyone. Asked his strategy, Davis offered a simple but elegant one: "To eat more donuts than everyone else," he said. "Hey, I had to win something." Sean Davis, the winner of the contest. 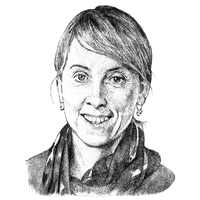 Multnomah County Commissioner Jules Bailey wasn't too far behind. "I only had two bites left," he said. So close! 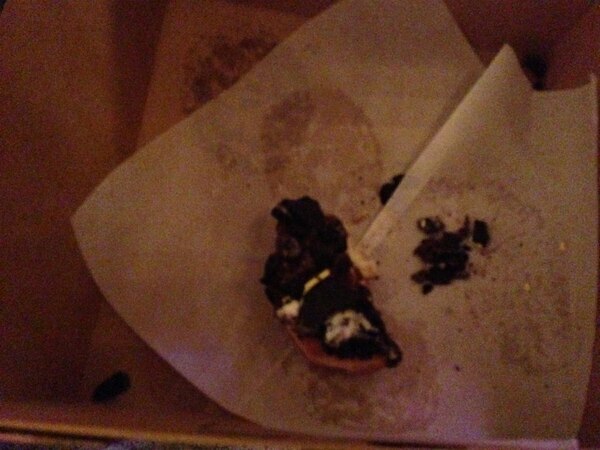 Multnomah County Commissioner Jules Bailey had only two bites left of his final donut. *The two candidates in the 2016 primary who also ran in 2004 are Lew Humble and David (The Ack) Ackerman.